In the previous section, we introduced the use of survival analysis, the need, and the mathematical objects on which it relies. In this article, we will work with real data and the lifelines library to estimate these mathematical objects. For this example, we will be investigating the lifetimes of political leaders around the world. A political leader, in this case, is defined by a single individual’s time in office who controls the ruling regime. This political leader could be an elected president, unelected dictator, monarch, etc. The birth event is the start of the individual’s tenure, and the death event is the retirement of the individual. 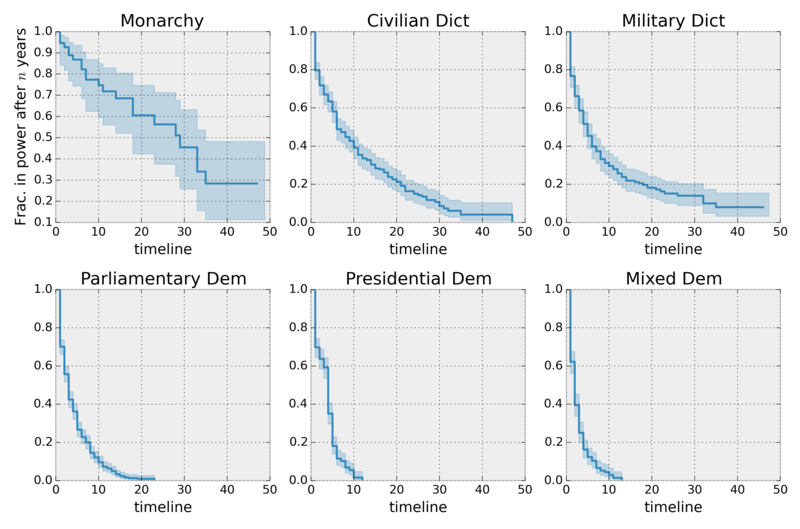 Censoring can occur if they are a) still in offices at the time of dataset compilation (2008), or b) die while in power (this includes assassinations). For example, the Bush regime began in 2000 and officially ended in 2008 upon his retirement, thus this regime’s lifespan was eight years, and there was a “death” event observed. On the other hand, the JFK regime lasted 2 years, from 1961 and 1963, and the regime’s official death event was not observed – JFK died before his official retirement. (This is an example that has gladly redefined the birth and death events, and in fact completely flips the idea upside down by using deaths as the censoring event. This is also an example where the current time is not the only cause of censoring; there are the alternative events (e.g., death in office) that can be the cause of censoring. where \(d_i\) are the number of death events at time \(t\) and \(n_i\) is the number of subjects at risk of death just prior to time \(t\). Let’s bring in our dataset. Other ways to estimate the survival function in lifelines are discussed below. 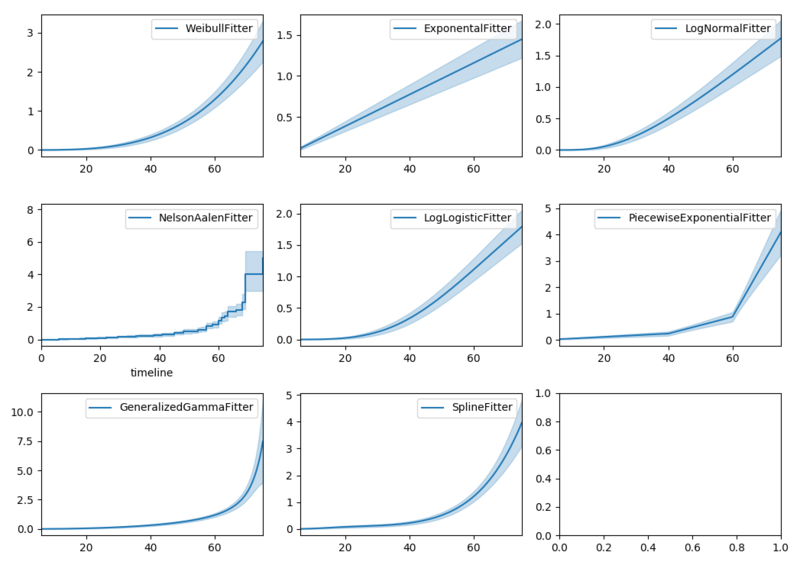 We next use the KaplanMeierFitter method fit to fit the model to the data. 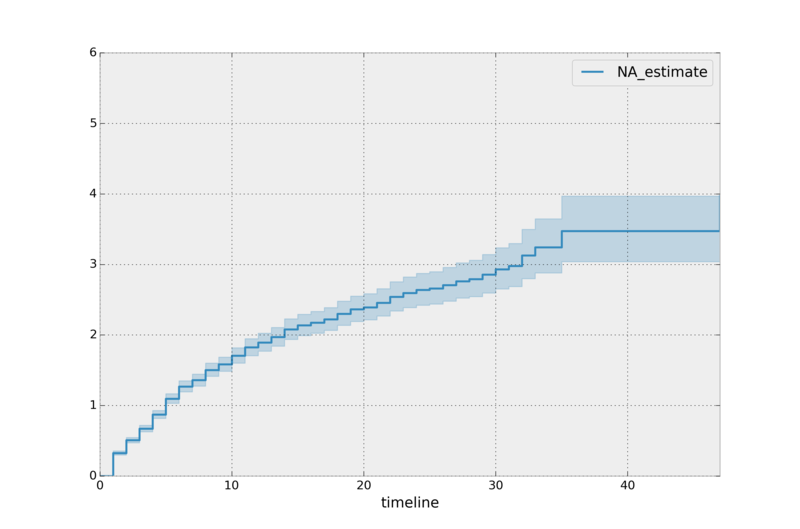 (This is similar to, and inspired by, scikit-learn’s fit/predict API). Interesting that it is only four years. That means, around the world, elected leaders have a 50% chance of cessation in four years or less! 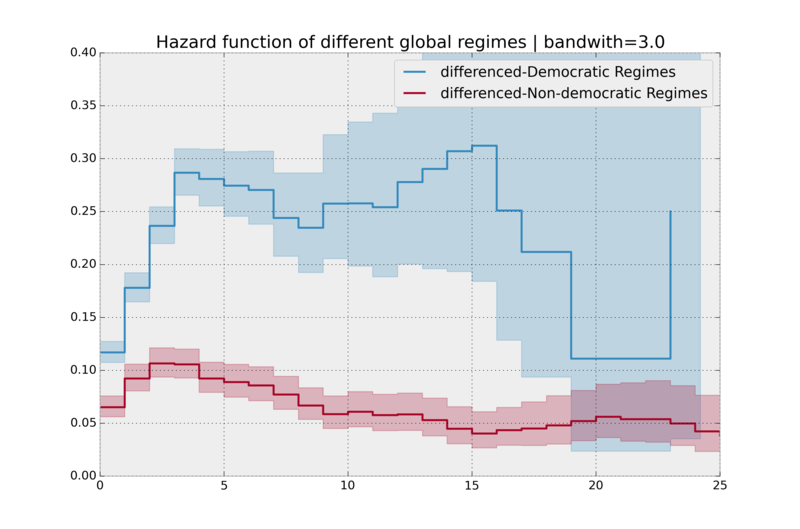 It is incredible how much longer these non-democratic regimes exist for. A democratic regime does have a natural bias towards death though: both via elections and natural limits (the US imposes a strict eight-year limit). 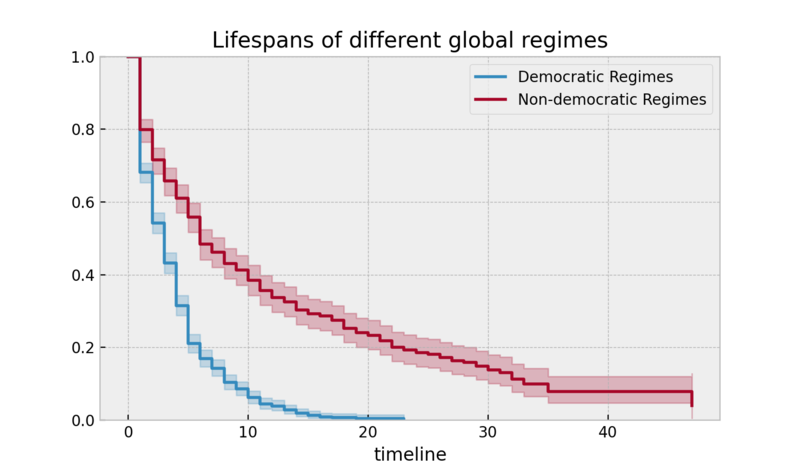 The median of a non-democratic is only about twice as large as a democratic regime, but the difference is apparent in the tails: if you’re a non-democratic leader, and you’ve made it past the 10 year mark, you probably have a long life ahead. 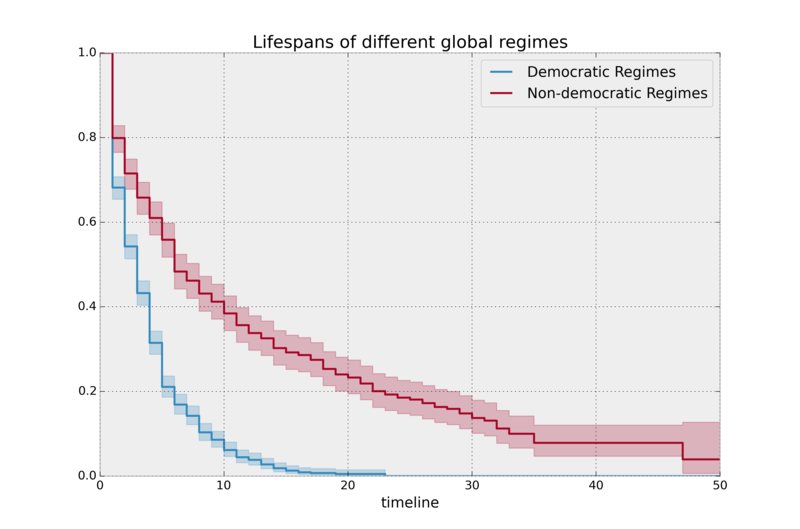 Meanwhile, a democratic leader rarely makes it past ten years, and then have a very short lifetime past that. Here the difference between survival functions is very obvious, and performing a statistical test seems pedantic. If the curves are more similar, or we possess less data, we may be interested in performing a statistical test. 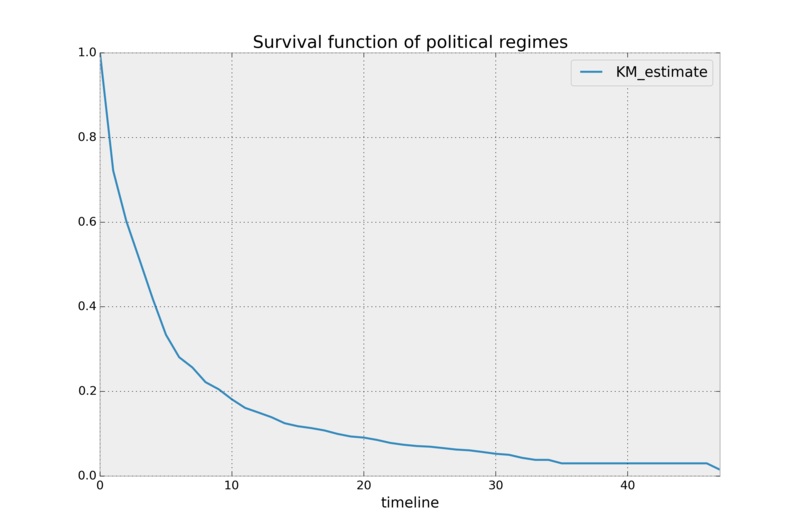 In this case, lifelines contains routines in lifelines.statistics to compare two survival curves. Below we demonstrate this routine. 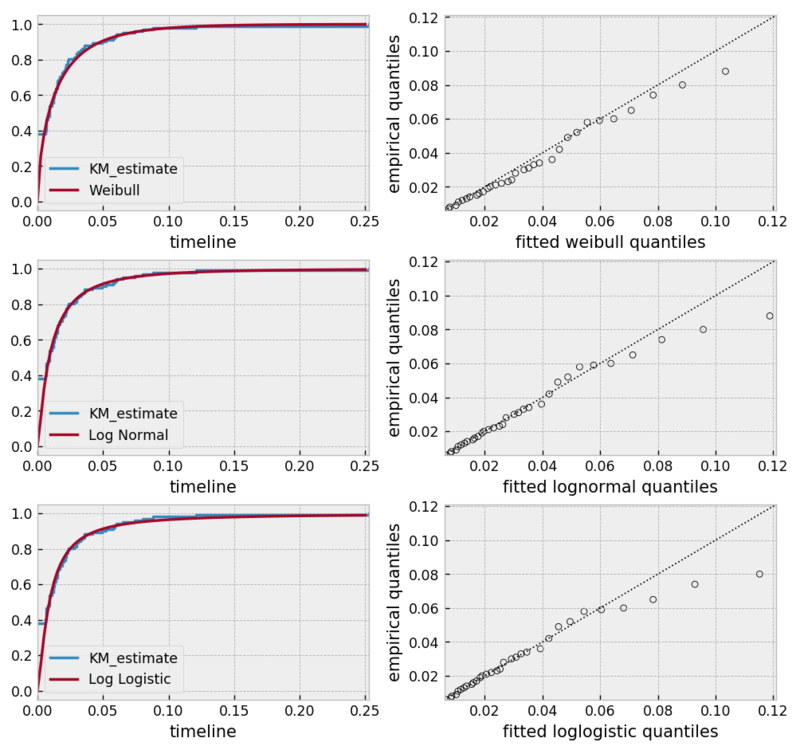 The function logrank_test is a common statistical test in survival analysis that compares two event series’ generators. If the value returned exceeds some pre-specified value, then we rule that the series have different generators. The function datetimes_to_durations is very flexible, and has many keywords to tinker with. where \(d_i\) is the number of deaths at time \(t_i\) and \(n_i\) is the number of susceptible individuals. The cumulative hazard has less immediate understanding than the survival curve, but the hazard curve is the basis of more advanced techniques in survival analysis. Recall that we are estimating cumulative hazard curve, \(H(t)\). (Why? The sum of estimates is much more stable than the point-wise estimates.) Thus we know the rate of change of this curve is an estimate of the hazard function. We are using the loc argument in the call to plot here: it accepts a slice and plots only points within that slice. 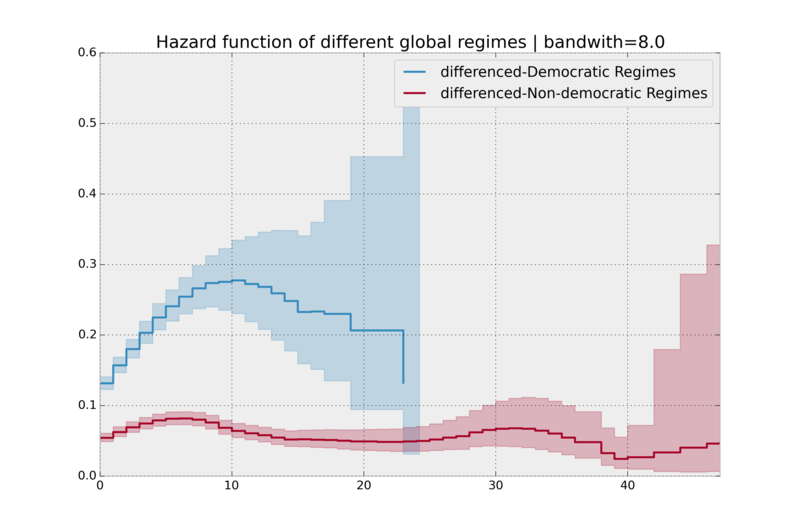 Looking at the rates of change, I would say that both political philosophies have a constant hazard, albeit democratic regimes have a much higher constant hazard. Interpretation of the cumulative hazard function can be difficult – it is not how we usually interpret functions. On the other hand, most survival analysis is done using the cumulative hazard function, so understanding it is recommended. Alternatively, we can derive the more-interpretable hazard curve, but there is a catch. The derivation involves a kernel smoother (to smooth out the differences of the cumulative hazard curve) , and this requires us to specify a bandwidth parameter that controls the amount of smoothing. 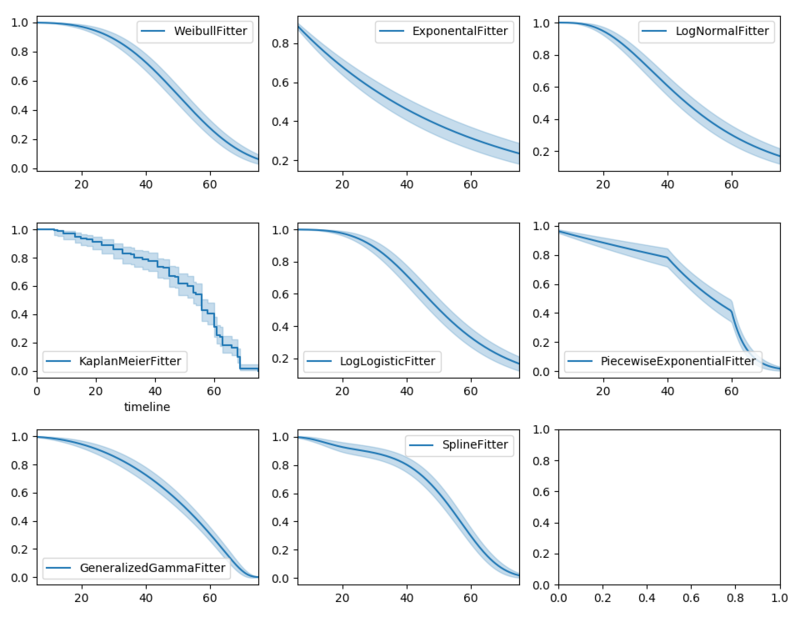 This functionality is in the smoothed_hazard_ and hazard_confidence_intervals_ methods. Why methods? They require an argument representing the bandwidth. 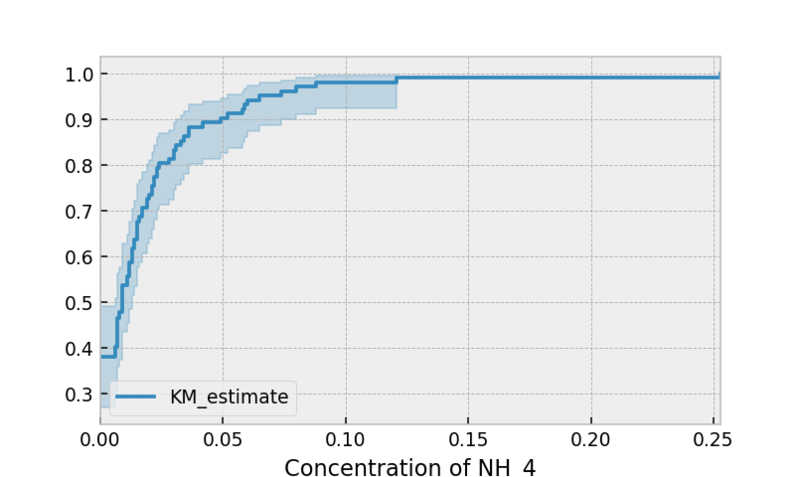 There is also a plot_hazard function (that also requires a bandwidth keyword) that will plot the estimate plus the confidence intervals, similar to the traditional plot functionality. 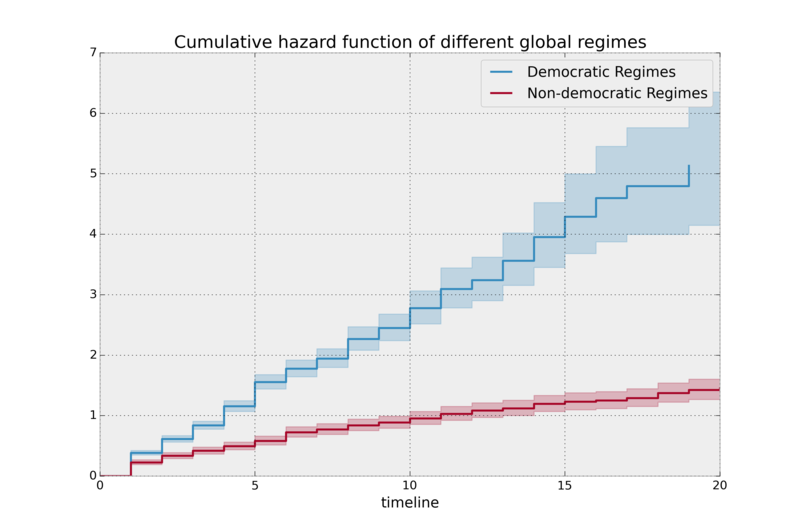 It is more clear here which group has the higher hazard, and Non-democratic regimes appear to have a constant hazard. There is no obvious way to choose a bandwidth, and different bandwidths produce different inferences, so it’s best to be very careful here. My advice: stick with the cumulative hazard function. 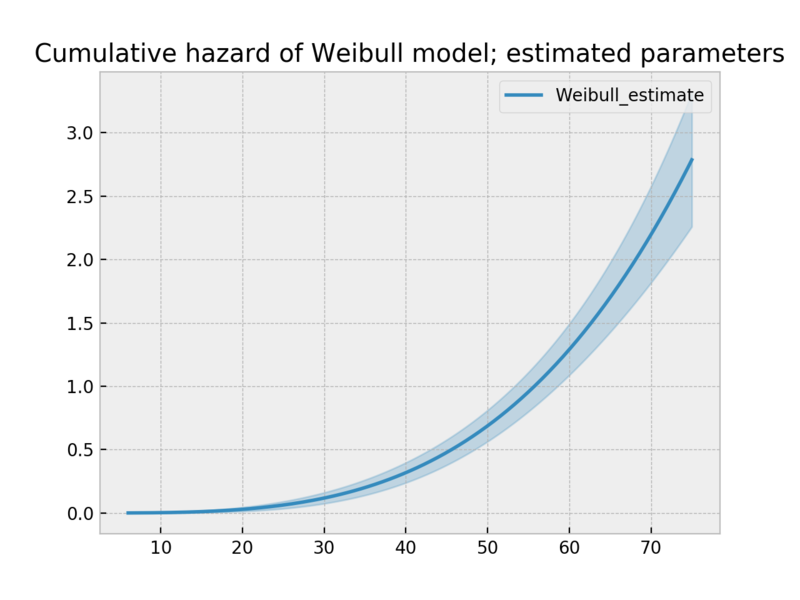 The parameterization of the Weibull and Exponential model changed in lifelines 0.19.0, released in Feb. 2019. In lifelines, estimation is available using the WeibullFitter class. The plot method will plot the cumulative hazard. Similarly, there are other parametric models in lifelines. 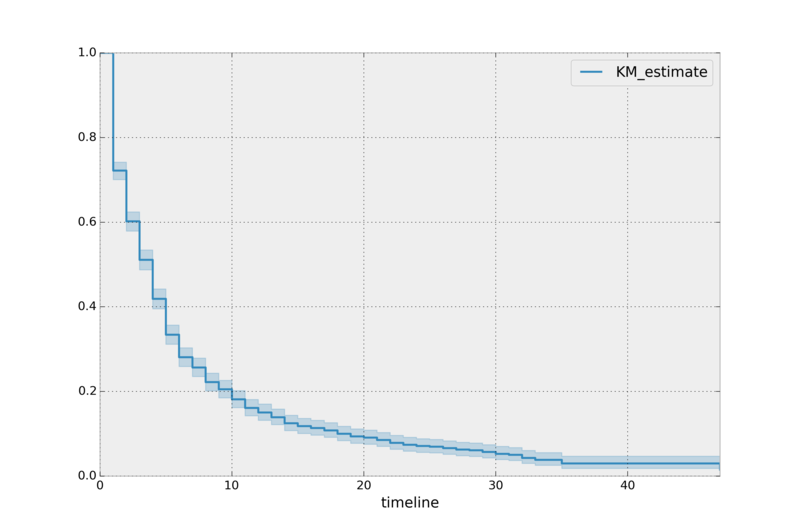 Generally, which parametric model to choose is determined by either knowledge of the distribution of durations, or some sort of model goodness-of-fit. Below are the built-in parametric models, and the Nelson-Aalen nonparametric model, of the same data. lifelines can also be used to define your own parametric model. There is a tutorial on this available, see Piecewise Exponential Models and Creating Custom Models. With parametric models, we have a functional form that allows us to extend the survival function (or hazard or cumulative hazard) past our maximum observed duration. This is called extrapolation. We can do this in a few ways. To aid model selection, _lifelines_ has provided qq-plots, Selecting a parametric model using QQ plots. We’ve mainly been focusing on right-censoring, which describes cases where we do not observe the death event. This situation is the most common one. Alternatively, there are situations where we do not observe the birth event occurring. Consider the case where a doctor sees a delayed onset of symptoms of an underlying disease. The doctor is unsure when the disease was contracted (birth), but knows it was before the discovery. lifelines has support for left-censored datasets in most univariate models, including the KaplanMeierFitter class, by adding the keyword left_censoring=True (default False) to the call to fit. Instead of producing a survival function, left-censored data analysis is more interested in the cumulative density function. This is available as the cumulative_density_ property after fitting the data. Alternatively, you can use a parametric model to model the data. This allows for you to “peer” below the LOD, however using a parametric model means you need to correctly specify the distribution. You can use plots like qq-plots to help invalidate some distributions, see Selecting a parametric model using QQ plots. 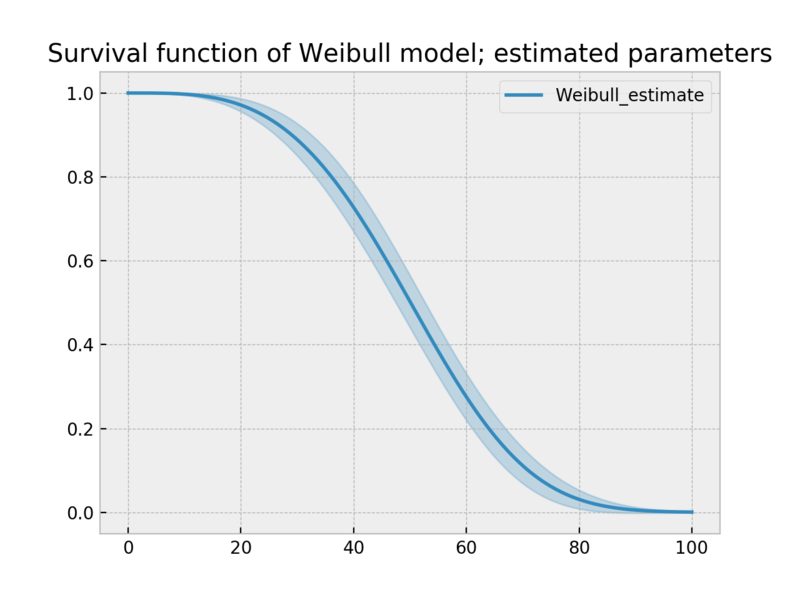 Based on the above, the log-normal distribution seems to fit well, and the Weibull not very well at all. Other types of censoring, like interval-censoring, are not implemented in lifelines yet. 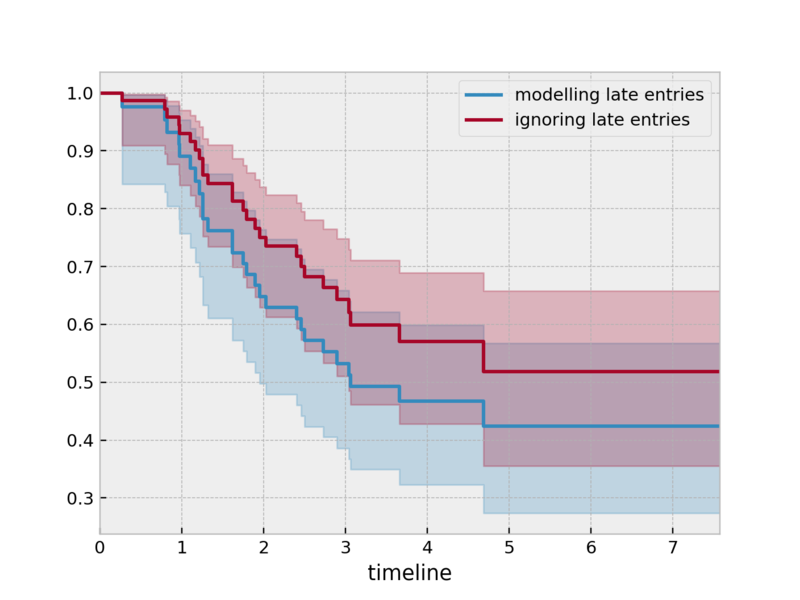 Another form of bias that is introduced into a dataset is called left-truncation (or late entry). Left-truncation can occur in many situations. One situation is when individuals may have the opportunity to die before entering into the study. For example, if you are measuring time to death of prisoners in prison, the prisoners will enter the study at different ages. So it’s possible there are some counter-factual individuals who would have entered into your study (that is, went to prison), but instead died early. All univariate fitters, like KaplanMeierFitter and any parametric models, have an optional argument for entry, which is an array of equal size to the duration array. It describes the time between actual “birth” (or “exposure”) to entering the study. Nothing changes in the duration array: it still measures time from “birth” to time exited study (either by death or censoring). That is, durations refers to the absolute death time rather than a duration relative to the study entry. Another situation with left-truncation occurs when subjects are exposed before entry into study. For example, a study of time to all-cause mortality of AIDS patients that recruited individuals previously diagnosed with AIDS, possibly years before. In our example below we will use a dataset like this, called the Multicenter Aids Cohort Study. In the figure below, we plot the lifetimes of subjects. A solid line is when the subject was under our observation, and a dashed line represents the unobserved period between diagnosis and study entry. A solid dot at the end of the line represents death. 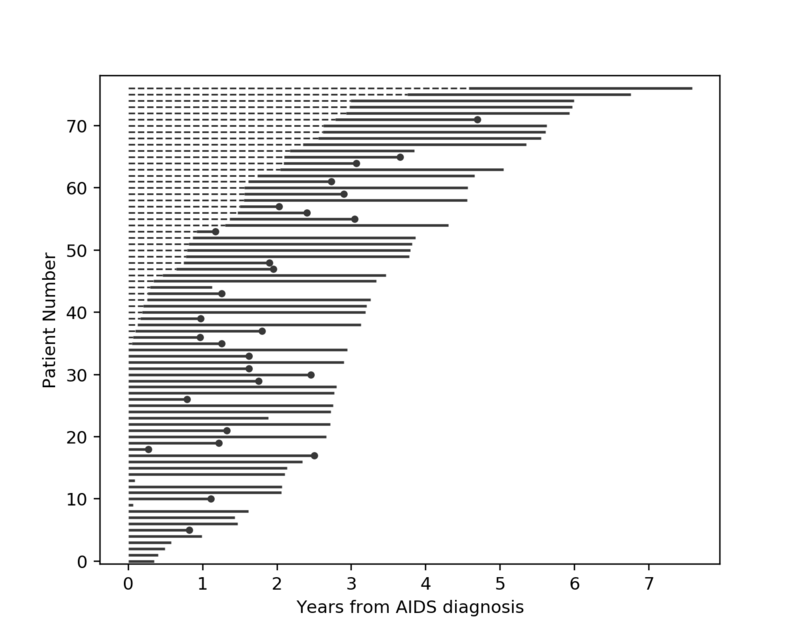 So subject #77, the subject at the top, was diagnosed with AIDS 7.5 years ago, but wasn’t in our study for the first 4.5 years. From this point-of-view, why can’t we “fill in” the dashed lines and say, for example, “subject #77 lived for 7.5 years”? If we did this, we would severely underestimate chance of dieing early on after diagnosis. Why? It’s possible that there were individuals who were diagnosed and then died shortly after, and never had a chance to enter our study. If we did manage to observe them however, they would have depressed the survival curve early on. Thus, “filling in” the dashed lines makes us over confident about what occurs in the early period after diagnosis. We can see this below when we model the survival curve with and without taking into account late entries.